The common name for the Hardy perennial Ajuga is Bugleweed. It typically flowers from late spring to mid-summer. Latin names include Ajuga reptans, Ajuga turkestanica and Ajuga reptans atropurpurea. Ajuga are matt forming evergreen plants that are ideal as a ground covering plant. Bugleweed has a mass of blue and purple flowering stems that sit above a foliage of leaves, that can be as variable in colour as deep green, purple, pink and cream. USDA-NRCS PLANTS Database / Britton, N.L., and A. Brown. 1913. Illustrated flora of the northern states and Canada . Vol. 3: 101. Common Names: Bugleweed, Ground pine, Bugle: Carpet, Common, Geneva, Blue, Mountain. Carpenter's Herb. Height: 2 to 20 inches (5—50 cm). Native: Europe, Asia, Africa, Australia. Flowers: Early spring through to mid-summer. Flower Details: Blue, White, Pink/rose. Upright spikes. Whorls of flower, Ajuga reptans has dark veins on the lower lips of its flowers. Foliage: Herbaceous. Opposite. Obovate. Rosette. Common Bugle has dark green leaves with purple highlights. Commonly grown cultivars have purple, pink, green, and cream foliage. Sow Outside: Cover seed. Spring or autumn. Sow thinly. Sow Inside: Germination time: three to four weeks. Temperature: 50 to 60°F (10—15°C). Water from below. Cover the container with a plastic bag until seeds germinate. Transplant to individual pots when seedlings are strong. Transplant outdoors once further established - in the summer. Space at 12 to 15 inches (30—40 cm). Requirements and care: Prefers shade, but will tolerate full sunlight. Good drainage. Most soils when grown in the shade. Requires a richer, humus soil when grown in full/partial sunny areas of the garden. Ideally soil should have a slightly acidic to neutral pH. Water during prolonged dry spells if growing in a sunny area. Remove un-variegated leaves. Remove offsets/runners from young plants to prevent spread; it is best to grow Ajuga in a contained area. Growing Ajuga in a sunny area also slows down its growth/spread rate. Deadhead to prevent seed set. Divide every three years to prevent rotting crowns. Propagate: by dividing clumps early in the spring or in autumn; self-seeds freely. Miscellaneous: Makes a great ground-cover plant. Invasive in some countries, especially in North America. Related to mint, and can be as difficult to control. The extensive root system makes it a good plant to grow if trying to control problems caused by erosion. Good plant to grow to prevent weeds as it is fairly easy to control. Can take foot traffic. 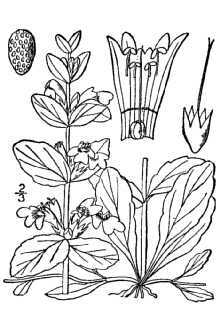 Traditionally used to stem bleeding. Attracts Fritillary butterflies to the garden. It is best to sow on the soil surface, then cover Ajuga seeds with a light dusting of soil on top. They should be spaced 15 to 30 cm apart in the spring or autumn. Ajuga species can grow in either full sunlight or in the shade. The soil should be dry and have a pH in the range of 5.5 to 7.1. 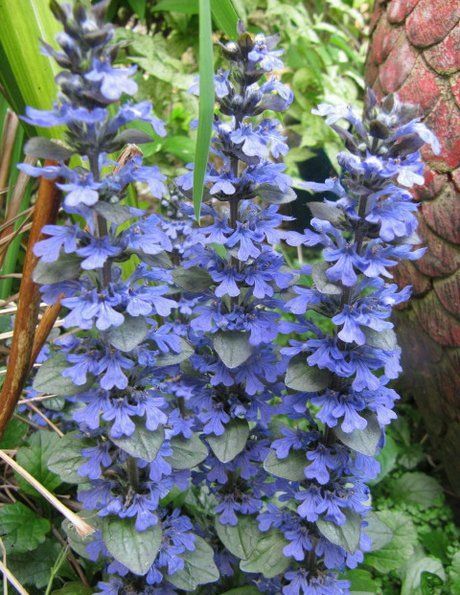 Ajuga requires between three to four weeks to germinate. If initiating growth indoors, they should be planted at a temperature of 10 to 12 degrees centigrade. Ajuga plant is very easy to look after. For best results they should be fertilised in the spring and watered frequently. Deadheads should be removed after flowering, and leaves removed in the Autumn.